Ba'el was the daughter of the male Romulan Tokath and the female Klingon Gi'ral, living in the Romulan prison camp on Carraya IV, where Klingon prisoners and Romulan guards lived peacefully together following the Khitomer Massacre of 2346. She also had a sense of tolerance between the two races because she was half Klingon and half Romulan. Her first contact with the outside world came in 2369 when Worf came to the camp. Worf discovered Ba'el bathing in a pond, and Ba'el fell in love with him. Worf responded to the romantic overtones until he discovered that she was part Romulan. She protected him when Tokath was going to kill him for influencing some Klingons to leave by standing in front of him as her father's men aimed their weapons at Worf. Ba'el stayed at the camp as she felt she would not be accepted by either the Klingons or the Romulans. In 2376, the camp in Carraya IV was attacked by Gorrik, son of Gannik, leaving Ba'el one of only three survivors. 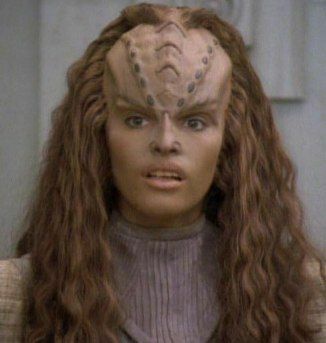 She was found and rescued by former camp resident Toq, who brought her back to Qo'noS and helped her reunite with Worf, then Federation Ambassador to the Klingon Empire. With the support of Worf she entered Starfleet Academy later that year.